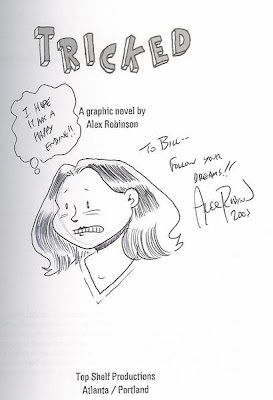 Head sketch of Caprice, my favorite character from Alex Robinson's Tricked (and she's in Box Office Poison, too, though she has a much smaller role there; and not that you asked, but my favorite character from BOP is Jane), drawn on the title page of Tricked, obviously, at the Comic Book Legal Defense Fund booth at the first and last Wizard World Boston in 2005. I also got an awesome Supergirl sketch from Robinson in exchange for joining the CBLDF. I posted it eons ago, but I'll have to post it again as a Pretty Sketchy one of these days. Anyway, Alex and his wife, Kristen, were very friendly and a lot of fun to talk to. Buy lots of comics from them.